Gorgeous, top-end home built to honor the historic National Park lodges. On three very private acres with a trout pond in front and a creek in the back. End of the road location, adjoining National Forest land and the Middle Cottonwood Creek trailhead. 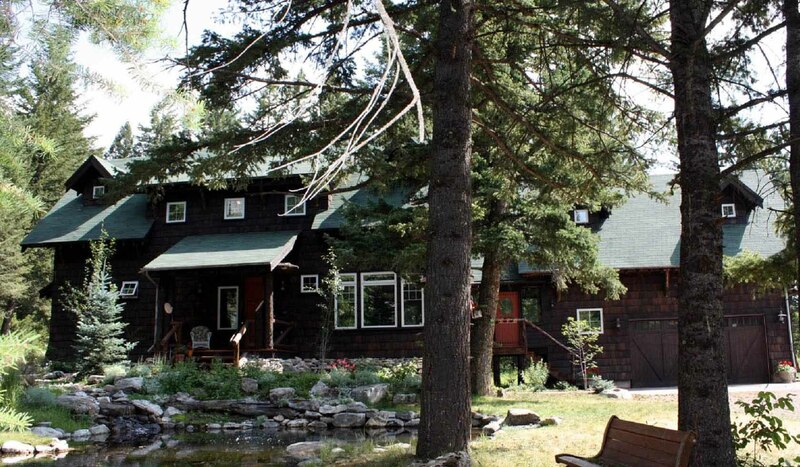 Super location tucked against the Bridger Mountains, but just a short trip to Bozeman. Brief Description: Adirondack family retreat? National park lodge? Both of these came to mind the first time we visited Saddle Mountain Lodge. The term is parkitecture, meaning it's built after one of the great hotels in the national parks; in this case Old Faithful Inn. It has that comfortable, settled-in feeling of a place that's been there forever, when in fact it's a brand new home with top of the line amenities. Bedrooms and baths: The home has three bedrooms and four and half baths with 2 extra sleeping areas. The master bedroom, with a king size bed, has double glass doors out to the yard and a beautiful private bath with a claw foot tub, glass shower and double marble vanity. Two upstairs bedrooms each have a queen size bed and private balconies. These bedrooms share a full bath with a glass and tile shower. The fourth sleeping area is on the lower level off the family room. It has a queen size bed and an attached bath with an oversized soaking tub and a lovely custom vanity, built from an antique china hutch. The fifth sleeping area is in the guest suite over the garage. It also has a queen size bed, a private balcony looking out to the forest and a full bath. All bathrooms have rain showers. A half bath is located off the livingroom. There are TV's in the master suite, one upstairs bedroom, and the guest suite. Kitchen: We love this kitchen! It's a cook's delight with built-in oven and microwave, 4-burner Viking cook top, oversized stainless Jenn-Air refrigerator, Carrara marble countertops and a ceramic farm sink. Dining area: The dining area has a table for six with extra seating at the island counter. There's a table for six and a gas barbecue grill on the patio. The guest suite has a table that seats four. Living room: With a massive fireplace reminiscent of the famous one at Yellowstone's Old Faithful Inn, it's really a great room. With a leather couch, cozy overstuffed chairs and moose antlers on the wall, it has a wonderful lodge feel. Four glass doors lead to the deck and the woodsy back yard. The great room has a full sound system and there's also wireless Internet throughout the home. Family: The large family room on the lower level has super comfy seating, a built in bar/sink/refrigerator, a 55' Sharp flat screen HD TV with VCR, Blue Ray player and full theater surround sound. Guest apartment: The fifth sleeping area is an over the garage suite with its own living room, kitchen, surround sound system, bathroom and washer & dryer. Setting and acreage: The lodge is tucked against the slope of the Bridger Mountains, in a private spot not far from Bozeman. On three woodsy acres with huge spruce trees for shade, a trout pond in front and rushing stream in back. A short walk puts you on Middle Cottonwood Trail, connecting to the whole Bridger Mountain trail system. Outdoor Amenities: Screened back deck, pond, stream, gas barbecue, an in-ground trampoline, firepit and stone patio, hammock and a play gym for the kids. Activities nearby: Besides hiking right from the house, you're about a half an hours drive to Bridger Bowl and Bohart Ranch ski areas. There's fishing on the East Gallatin and main Gallatin Rivers, horseback riding, rafting, tours of Yellowstone Park and the fun town of Bozeman. It's a beautiful two hour drive to Yellowstone. Closest town and airport: It's 8 miles from Bozeman's Main Street and Gallatin Field Airport.